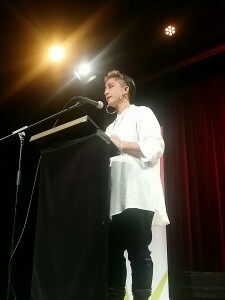 I was recently asked to speak at the Stella Prize which promotes the writing of our greatest female writers in Australia, as well as awarding one a huge cash prize for a recent book deemed to be a great writing feat. Due to many requests, here’s the piece I wrote and shared at the Stella Prize. Feel free to share this around and to leave your own comments. This is the poetry of Ali Cobby Eckermann, a Yankunytjatjara / Kokatha woman who was born then tricked away from her family on Kaurna land whose poetry felt like the most natural non-fiction work to share with you. All my life I have felt like an outsider with regards to language – a land for the elite, the educated middle to upper white classes. Academic writing, a lot of non-fiction, even some investigative journalism can feel impenetrable. Like a language for only a few – a kind of pervasive elitism that persists, articulated in convoluted in-knowledge that outsiders like me – born of immigrants and without higher education – can not access. This holds true, often, for poetry too. There have been many tomes dedicated to dead white men making millions as skeletons whilst living women of colour toil over ground breaking, heart shattering work that moves in ways so visceral it is hard to remember to breathe whilst reading. And yet still in this country, poetry that is so enamoured by it’s own cleverness and poets dazzled by their own adroitness still get lauded by the establishment. So, though I was tempted to talk about the essays of Arundhati Roy who taught me that I could speak out with truth as my firearm, though I was tempted to talk of the ongoing impact on me of Silvia Federici and her book Caliban and the Witch which made the whole history of the subjugation and oppression of women so easy to understand – so easy, so enraging and heartbreaking, I decided instead to speak about one of my favourite and one of Australia’s greatest living poets Ali Cobby Eckermann. I don’t need to tell you that Non-Fiction is a huge pool and as far as I’m concerned poetry is part of it’s waters. Poetry is a liquid truth – certainly to the author, and too for the reader who swims in it, often upstream. It is non-fiction in so much as it is autobiographical – a snippet or moment in time of the writer. A glimpse into their consciousness, access for a fleeting second into their mind. It is documentation of the personal, the political – inseparable as they are. Poetry has the potential to pierce through the intellectual and head straight for the heart. It can move people in ways other crafts can’t. So it is with Ali Cobby Eckermann’s work. Is it hers or is it mine? Ali grew up with her Lutheran adoptive parents but at 17 ran away and unwittingly headed to the birthplace of her mother, at Ooldea on the Nullabor Plains, living there for two years without any idea that that was where her kin were from. I love this part of her story – that she is poetry herself writing with her body what she eventually put to page. It is Ali’s continuing and consistent language of forgiveness and compassion in the face of such unimaginable trauma that truly inspires me. How she can remain fierce and grounded in all her truths and still speak and write with great humanity. When she signed my copy of her book “Inside my Mother” from which all these poems are from, she wrote “To Candy Royalle, the language of loss is the victory”. Even though we have spent a little bit of time together, I’ve never had the courage to ask her exactly what she meant by that. In any case, I took it to mean that we who know suffering, we who have witnessed the oppression of our people and fought for some form of acknowledgement or justice, we who have found the words to use, who continue to rally and push and create and demand and share and speak unapologetically about all the injustices, we who share stories in the hopes of rehumanising the dehumanised – we are truly the victors. This is the point of poetry for me. Poetry not in love with itself, instead, poetry in love with the telling of true history. I do not for a second presume to understand the suffering of the Stolen Generation. I can never. Though we know how it sounds, read about it, talk about it, though we have witnessed a Prime Minister apologise for it, we can only gather information on an intellectual level and know the damage, the very wrongness of such a program of enforced assimilation based on good intentions which is part of the greatest crime this nation has ever committed. We can only intellectualise the damage of white-washing, the decimation of culture, of language and oral storytelling, the flagrancy of a history written by white oppressors. But we who are not Aboriginal can never, ever truly understand what that trauma feels like. We can empathise and act as allies but we can not ever fathom the sense of absolute devastation and loss. Poetry can however bring us closer than any article, any report, any list of dehumanising statistics where the continued reduction of humans to numbers is a massive injustice. It can bring us closer to a visceral and emotional understanding of that suffering. Maybe, through the poetry of Ali Cobby Eckermann our empathy and compassion can be turned into action. Currently, the removal of Aboriginal children from their families is happening at a rate greater than the first Stolen Generation. That is to say that right now, history is repeating itself and that “Sorry” on our behalf, echo’s hollow. Reading Ali’s poetry hands us our humanity so that we understand intrinsically and viscerally that the removal of children from their people should not be happening, that it is a crisis of massive proportions. Once our hearts have been cracked wide open, once we’ve bypassed the intellectual which can be influenced by excuses and false justifications, misinformation and prejudice, once that poetry takes a hold of every cell and particle and atom that makes us up, perhaps we will be propelled to engage and ask the first people of this nation – how can we help stop this? Tell us what to do.